Ms. Sheketoff is probably referring, in the article below, to the same speech I attended at the ALA Annual Conference in Chicago in June 2005. 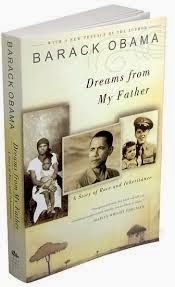 Then-Senator Obama autographed my copy of Dreams From My Father "To Harry The Library, Thanks for the great work." Let's hope he hasn't forgotten what he knew and "preached" then - that libraries continue to be a crucial keystone for the lifelong learning of an informed public. This is a wonderful summary of how libraries continue to fill that role. Thank you Emily Sheketoff! It was my pleasure to be in the audience today for President Barack Obama’s speech about the ConnectED initiative at Buck Lodge Middle School In Maryland. I found myself thinking back to a speech I attended by then-Senator Barack Obama in 2005, where he credited libraries with helping him land his first job as a community organizer. Ninety-four percent of parents agree libraries are important, so I was disappointed to find libraries conspicuously absent in President Obama’s vision of connecting our students to world-class learning. The President opened his remarks with his commitment to significant investments in education. But he missed the mark in a few key ways. First, he failed to recognize the importance of an effective school library program. ConnectED must include professional development and support for school librarians, in addition to broadband access and devices, to ensure students have the digital literacy and research skills necessary to effectively use those devices. At a broader level, U.S. school, public and higher-education libraries complete education and help jumpstart employment in every community in this country. Afterschool WiFi use in public libraries spikes at 3:01 p.m. when students bring their devices and homework assignments to one of more than 16,000 library locations. New digital learning labs in libraries are seed beds for people to create content, as well as consume it—demanding upload speeds that rival download. And videoconferencing shrinks distances and empowers uses that range from virtual field trips with NASA in Maine to distance education and professional development for high school principals in Oklahoma. Sixty-two percent of libraries report they provide the only free access to computers and the internet in their communities—for rural areas, this percentage climbs to 70 percent. With one-third of Americans lacking home broadband access, libraries provide a digital lifeline that supports essential education, employment and e-government needs. From the Department of Labor to the Department of Health and Human Services, federal agencies have called on OneStops and Head Start programs to coordinate with their local libraries to achieve their missions. When one must have digital access and skills to find a job, apply for unemployment benefits, or enroll in a health exchange, libraries are the one place for all. Library needs for high-capacity broadband are clear: fewer than 10 percent of libraries have internet speeds of 100Mbps or higher, and one in five libraries has speeds of 1.5 Mbps or slower. One internet user participating in an interactive distance learning program can cripple access for dozens of other learners in the library. This is not acceptable. If we’re serious about learning, then we must be serious about libraries. The original framers of the E-rate program understood this, and we hope the President will recognize and engage the power of libraries and librarians in connecting communities and achieving the vision for 21st century education and a globally competitive economy.